-Vibration-Free Rigid Disc Clamping System. -Die-Cast Aluminum Overhead Turntable with Precision Helicoid Clamp. -Bitstream, 1-Bit, Double Differential DAC in each Channel. -20 Bit, 8 Times Oversampling Digital Filter. -3rd Order Butterworth Analog Filter. 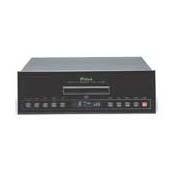 -Remote Control Through local or McIntosh Control Centers or through CR12/MX130/MX132. When I was buying a new all McIntosh system in the late 1990s, the last component I acquired was the MCD 7010. Like other reviewers, the addition of the Mac CD player caused several of my friends and relatives to wonder if I had a whole new system because it improved the sound so much. It sounds wonderful and works flawlessly. I have used it nearly every day since I purchased it and never had a problem with it. I would highly recommend this component. For full disclosure, I have been a McIntosh fan since 1970 and still own and use all the pieces I purchased then. None of them have ever needed maintenance and all sound terrific today. An excellent investment. This cd player sounded great the day I brought it home and still sounds great more than 10 years later. When I purchased it, several of my friends and family members asked if I had gotten a whole new system even though it was the only thing that changed, Never had a problem after many hours of use. Like most Macintosh products, it just keeps giving great sound. Open soundstage, classic McIntosh sound. Sweet highs, dynamic mids and quick but mellow lows. This cd player might as well have tubes in it.